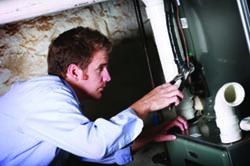 Our certified technicians are experienced in installing all types of home comfort systems. From oil-fired boilers to mini-split ductless air conditioning systems to humidifiers, we have the skills and knowledge to provide you with a quality system installation. Our estimates are always FREE and our goal is to help educate and inform our customers so you can choose the system that best fits your home comfort needs. In the end, you will have the right equipment to meet your needs efficiently, safely, and with years of home comfort moving forward! Contact us for more information on our products and installation services at (413) 583-6923!